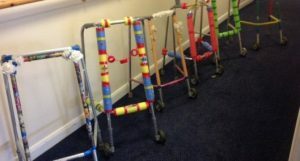 Care homes across the Country have been getting creative with the issue of resident safety, by encouraging residents to personalise their otherwise lacklustre grey Zimmer frames. The ‘Pimp my Zimmer’ scheme originated in an Essex care home in 2016 and has gone on to reduce falls in some care homes by up to 60%. 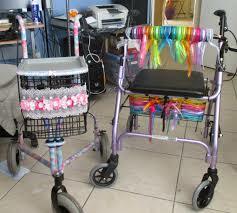 Zimmer frames have been decorated with ribbons, football scarves, knitting, patterned paper, cuddly toys and many other items. The brighter colours are more easily recognisable to people with cognitive impairments such as dementia. Dementia can cause a loss of visual definition to separate items, leading to everyday items merging together and being overlooked. By decorating their own frames and making them unique, residents are both encouraged and reminded to use their own personally height adjusted frame. Residents’ forgetting to use their frames or using ill-fitting frames may lead to more falls and an increase in potential hospital admissions. Although this project was originally born out of concern for resident safety, it has provided so many additional benefits. 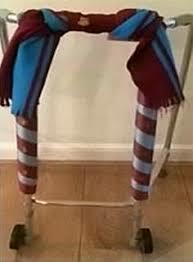 The unique decoration can make residents experience of using a walking aid more positive reducing feelings of perceived stigma often attached to them and provides an opportunity for further social interaction between residents. The decorated frames are a talking point as the individual designs reflect their own hobbies, personalities and sense of humour. The simple act of decorating the Zimmer frames provides an opportunity to improve fine motor skills and can be a fun shared social activity without age barriers. Grandchildren can help grandparents decorate their frame during a visit, bringing together and opening communication between generations. Staff can assist residents with this creative project promoting mutual trust and respect. This scheme is a clear example of a simple idea which has a very strong impact on the overall safety and wellbeing of elderly people within the care community.